I love receiving feedback from my customers and especially when they come up with an alternative way to sew my pattern up. Teri purchased my online course a couple of months ago and has been busy sewing doll clothes for her gorgeous dolls ever since. 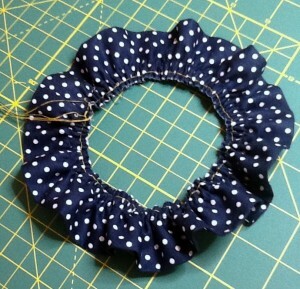 While making my Frill Hat pattern up she found an alternative way to attach the frill to the cap that worked better for her and she has kindly sent me photos and an explanation of what she did so that I can share it with you all. 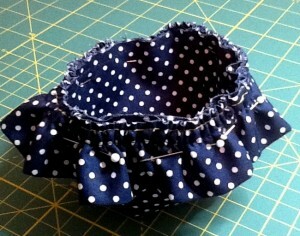 She followed my instructions for making the cap and the brim but then uses the following method to attach the frill. 1. 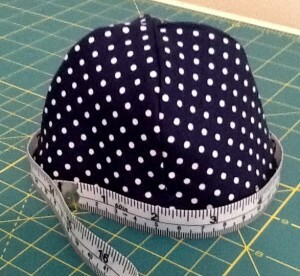 Measure the circumference of the top of the hat. 3. 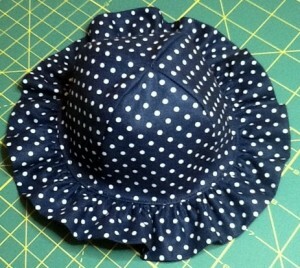 Pin the brim to the top of the hat, matching back seams together first. 4. Follow Steps 7-9 of my original instructions to finish the hat. 5. 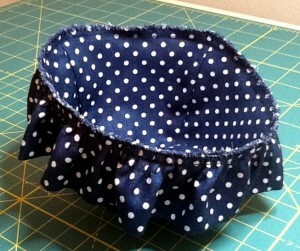 Here is the finished hat. I have to say a huge thank you to Teri for sharing this with us. I have been sewing heirloom baby and children’s clothes for 30 years I have a baby doll, which I’ve had since age 3, that I would love to make a traditional baby outfit for, so as to display him. I have several patterns I have tried to make for him, but, being a doll, his proportions are a bit odd. Mostly the shoulder to belly ratio. can you give me some advice on this adjustment. My doll is a Madame Alexander. I believe his original name is Kathy. He is made of heavy vinyl. I believe he was made in the 1940’s or 50s. Hi Terri, I’m not familiar with your particular baby doll and I don’t know what patterns you are trying to adjust so I cannot be specific with what adjustments to make. If it is mostly the shoulder to belly ratio that is different to that of a ‘real’ baby then that is where you will need to either shorted or lengthen your pattern pieces. So shrink your pattern normally using a photo copier or your printer based on the majority of the measurements (you may find a number of blogs on my Resources page that may be helpful for resizing your patterns) and then make further adjustments to the pieces as necessary. If you are doing a shirt, then you would cut across the front and back pieces and shorten or lengthen them if there is shape to the pattern or if it is straight down, then adjust the hem. If you feel the armholes are too big/small you could make the cut across the armholes and make the adjustment here. If it is an outfit with a yolk, you can either shorten/lengthen the yolk and the skirt or just the skirt depending again on the original pattern. I’m sorry I can’t be more helpful at this stage but when I don’t know your doll or the patterns it is a little tricky. I hope the blogs I have directed you to will help and of course if someone else is familiar with this doll please leave your comments below. Otherwise you can always email me more details and we can go from there.